Greetings from 7316B's Lock In! 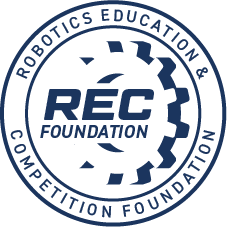 These are the fundamentals of robotics. 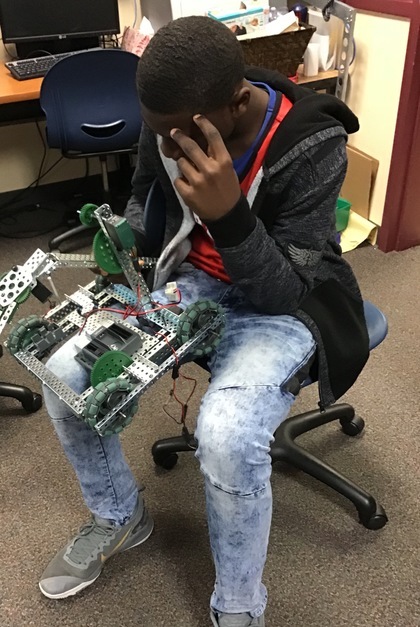 All three of which were exercised during our Robotics night-long Lock-In event! 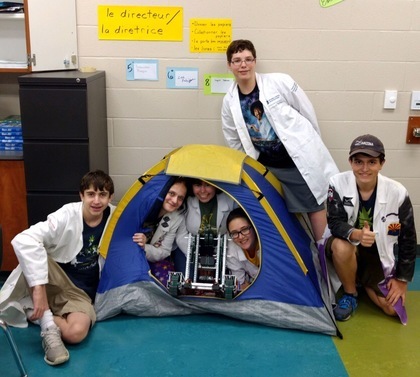 In the photo you can see all our members posing inside the tent, even including the robot! 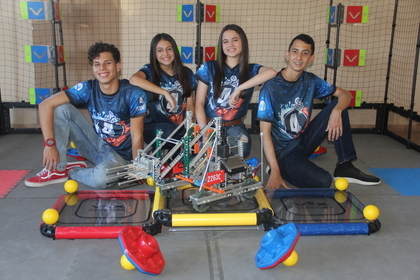 Hi, we are team 11442N from New York City. 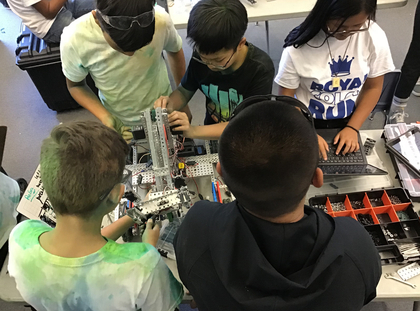 We are in VEX IQ middle school robotics. 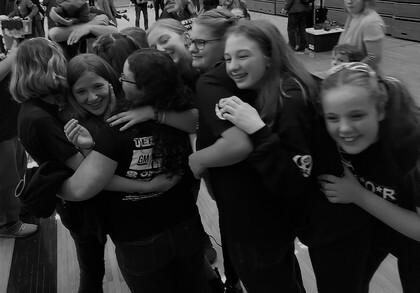 For the 2018-2019 season we hope to get to VEX Worlds. 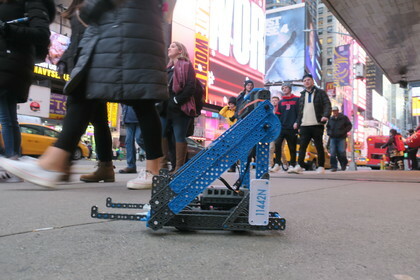 Our photo shows our robot in the middle of Times Square with crowds of people around it. 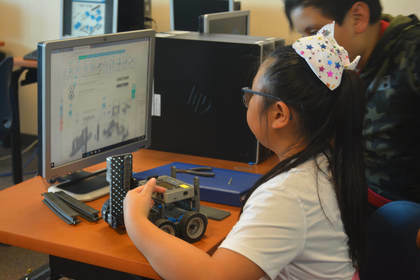 Behind every successful robot, there are hours of determination and hard work. 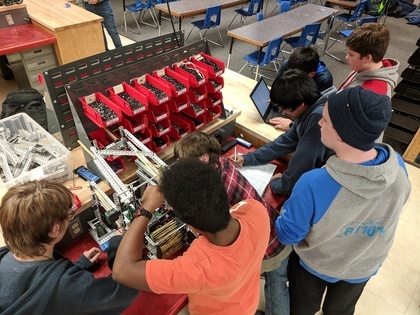 Every member of a team plays an important role in the creation of the best robot. We are the AquaBots and modern day Rosie the Riveters. During the STEM competition at Worlds, we had to wait outside the judging room. We had time to practice our STEM skit, which was a presentation about Rosie the Riveter and the laws of robotics used on naval ships. We decided to have a little fun and practice our speech in our wagon. My mom says that we were "goofing off", but we really were practicing. We ended up winning the STEM Research Project Award for the Viking division! Extra practice (even in a wagon) really does pay off. 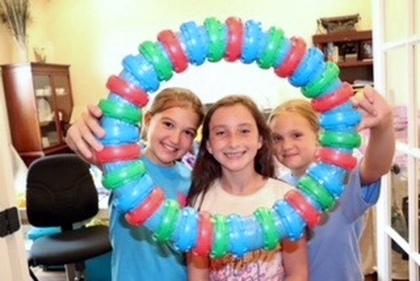 We had so much fun creating a dolphin enrichment toy out of recycled robotics parts. 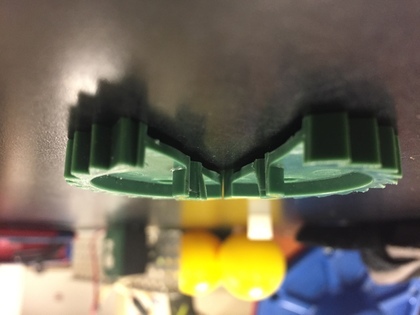 While learning about marine conservation and the durability requirements of dolphin toys, we thought of a good idea to recycle last year's game parts. We presented the dolphin toy to our local marine institute. Apollo the Dolphin loved our new toy and our toy even survived all of his sharp teeth! 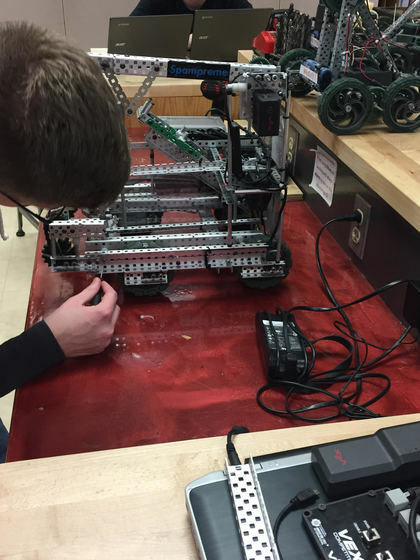 One our team members(Matthew) is touching up the robot before our tournament in two weeks. One of our other team mates in the back (Andrew) is not pictured, but is working on the chromebooks seen in frame. He is working on finishing our program for the upcoming tournament. Hard work is being done to meet our deadline in a couple days to be fully operational for competition. Our roboot is in our programs field to be tested with its new skills autonomous. We also are aiming to test its overall performance to give our drivers more practice with controlling it prior to our first major tournament of the season. Our main programmer (Hunter) is visible in the image resetting the field after a skills run. In the near future we will be in the process of adding a new component to our bot which is intended to hold caps more securely than our current mechanism. 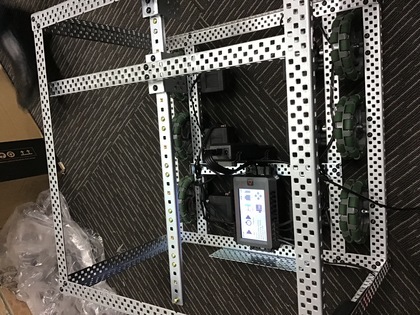 Our team wants to capture the true meaning of VEX Robotics through the idea of photography by taking a photo of our new V5 robot to show what you can achieve through the idea of robotics. Hi, this this Sun Woo Park from team 6446B. 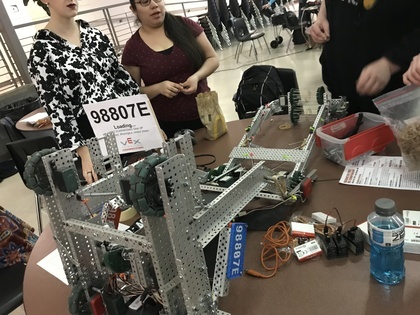 From my experience, joining team 6446B was the best choice I made throughout robotics because here, I learned how to cooperate with teammates and I was able to find my career path. 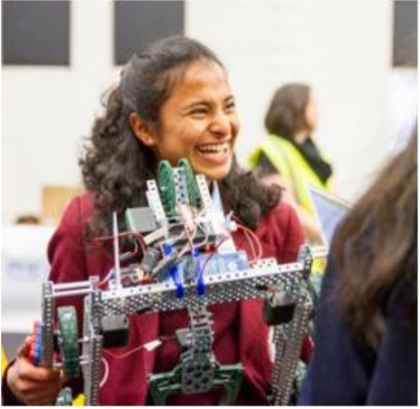 Adding on, in team 6446B, I was able to gain more experience on engineering and having leadership for being the lead engineer. I hope our team will hopefully go to World Championships. Success is driven by innovation and cooperation. 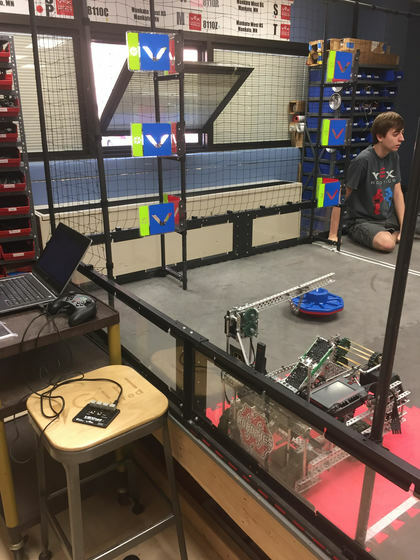 The VEX robotics team is a group of highly motivated and cooperative students. I love their teamwork. 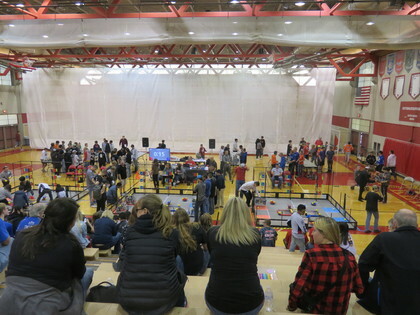 The adrenaline-busting cycles of VEX in The Zone competion they participated in also gave me a fond emotion. Our team took this photo after shooting a flag. The force from the shoot broke our gear in half. We like all our parts custom made that way. We have parts from the past that are similar to what happened to the ratchet gear. We were in a hot sweaty room. Scouting, driving, practicing, having judges meetings and having fun. It was finally time for awards. We were waiting and waiting for our names to be called. The last award. Excellence. And it was our number! We were so excited to get our award. The hard work was worth it all. The old members of the team were there to celebrate with us. So we shared one big group hug. 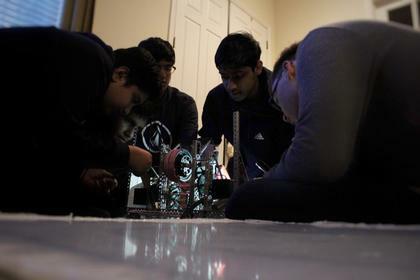 One of the things I love about robotics is how different people from all over the world are willing to come to gether to do something that they love. Started from sketch, joining our desire, effort and ideas… The journey has united us, robotics have made us brothers. 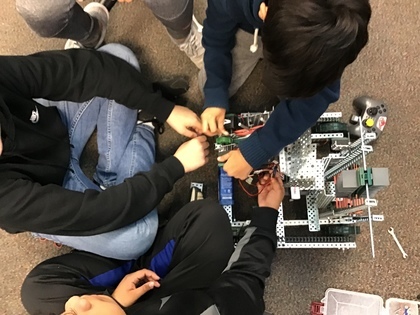 We have reached our common goal: to finish our robot to participle in Vex Robotics Competitions. The satisfaction of teamwork! This is an image of one of our engineer, Stana. Here is our photo for this challenge. 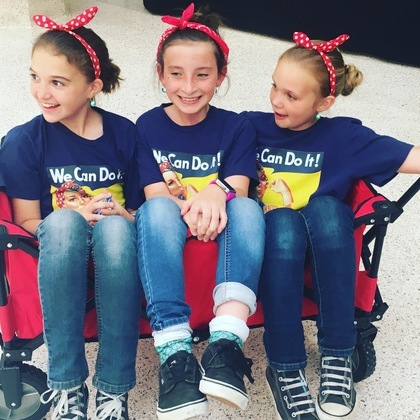 The 'GRL PWD' stands for Girl Powered. 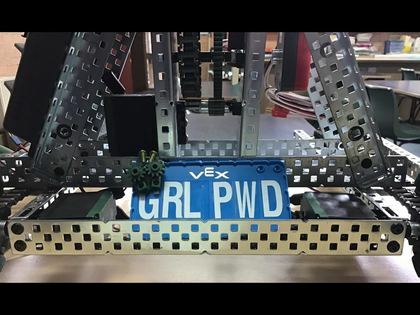 The fact the we put the number plate on our robot means that we believe girls need to be more involved in VEX Robotics, or just Robotics/Engineering in general.